Udo Kier plays Konrad, Christoph Waltz plays Dusan, Hong Chau plays Ngoc Lan Tran and Matt Damon plays Paul in DOWNSIZING. ©George Kraychyk. 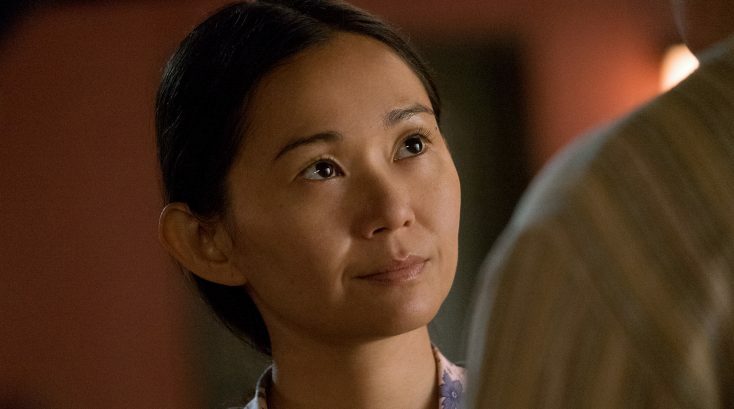 HOLLYWOOD—2017 is becoming quite the year for Hong Chau. The daughter of refugees who fled war-torn Vietnam for the U.S. in the late 1970s, is now the female star of two-time Oscar winning filmmaker Alexander Payne’s “Downsizing.” In it, she plays a Vietnamese dissident who was forcibly reduced to a mere five inches tall to serve the well-off residents of a community of similarly sized people in America. Her performance already is receiving positive notices from her peers as well as critics. She is a Golden Globes and a Screen Actors Guild nominee for her performance. Could an Oscar nom be far behind? Chau, a youthful 38, is keeping it all in perspective. Chau previously had a recurring role on the New Orleans-set TV series “Treme,” and Paul Thomas Anderson’s quirky 2014 comedy “Inherent Vice,” opposite Joaquin Phoenix, among other roles. In “Downsizing,” she delivers a breakout performance, starring opposite Oscar winner Matt Damon (“Good Will Hunting”), who plays an occupational therapist that undergoes a voluntary medical procedure in which he is reduced to the size of a human hand in order to help preserve the world’s shrinking natural resources while maintaining a comfortable middle-class lifestyle, where everything is miniaturized. Damon’s Paul Safranek meets Ngoc Lan Tran (Chau) who has been brought to that self-contained tiny world after she and other dissidents were forced to be downsized and then shipped across the ocean in a TV box that was destroyed en route. The only survivor of that shipment, Ngoc lost part of her leg and does her best with a makeshift false leg. In the new world, Ngoc operates a housekeeping service and, in her spare time, helps the poor and disaffected people of the community. She enlists Damon’s help in her philanthropic work and gives him a broader perspective about humanity. Although some film critics have expressed disdain over her character’s halting Vietnamese accent, others have praised her for funny, scene-stealing depiction. Chau says she was not trying to create a derogatory caricature, but an honest, truthful character. Born in a Thailand refugee camp to Vietnamese refugees, Chau emigrated with her parents and older brother to New Orleans when she was a baby. She grew up bilingual in the multicultural Big Easy, and developed a passion for writing and acting. After graduation from Boston University, she relocated to Los Angeles where it didn’t take long for her to land the “Treme” role. During an interview with Southeast Asia Globe, the gracious, thoughtful actress spoke about her leading lady role, discovering her Vietnamese roots and living in a changing Hollywood environment. Chau: My parents left in 1979. They were part of the boat people who left. They were on the water for three days until they ended up at a refugee camp in Thailand and that’s where I was born. That same year, we ended up in Louisiana because we had a sponsor family who was also a Vietnamese family but we were not related to them. It was organized through the Vietnamese Catholic Church in New Orleans and we lived with them for the first, I think, year or two until we got our own apartment. So my parents did not speak any English (and) didn’t really know anyone, not a soul when they came over. I have an aunt and uncle who ended up in Sydney, Australia. We’re kind of spread and that’s the refugee story for Vietnamese people. Q: Have you had an opportunity, either through your work, or just on your own to return to Vietnam? Chau: I did go back once with my family. My uncle was getting engaged, and we went back for his engagement party. It also was an opportunity for my family to go back there together. That was nice because I met family that I’d never met before. It was an interesting experience for me because it had been so long since my parents had been back. There was something a bit sad about it because a lot of the streets had changed and things were so different from when they left. When we were sitting in the car, they’d ask the driver, “What happened to so-and-so,” or “What happened to that place. It used to be over there.” So much had happened in the past 30 or so years. I would have loved for them to go back to the country they remembered but that’s not really possible. Q: What was the experience like for you? Chau: When I told my friends I was going to Vietnam, they were very excited for me. I was going back to the Motherland. When I got there I immediately sensed how American I was. (She laughs.) They could just tell that I was from America without having me open my mouth. It’s the way I carry myself. It’s all sorts of things. That was interesting because I feel a little bit in limbo and in between two cultures when I am in the United States. When I went to Vietnam I still felt exactly same way of not entirely belonging there either. Q: What was your take away from that experience? Chau: Most people who come to the U.S. as refugees left their native country for devastating reasons. Coming here and not having a support system and just having to survive work really hard, most (native) Americans see immigrants as hardworking but they don’t really know much else about them. My parents gave me a life so that I could go off and have a better one and because of the way the U.S. culture is, better usually means having nicer things, and I don’t necessarily agree with that. When I was younger, my mom would rib me and my older brother because we didn’t want nice things. It’s funny, my older brother and I were like hippies. We didn’t aspire to have expensive cars and a fancy house. I still feel that way. I don’t want to drive a luxury car or have the latest electronic gadgets. It’s not important or a priority in my life. It took a little time, but my parents have also come around to my way of thinking. They no longer subscribe that that false version of the American Dream. The American Dream doesn’t necessarily mean driving a Range Rover or living in a gigantic mansion. Yet that’s what’s pitched (to immigrant children) as the definition of success. I feel like I’m succeeding even though I’m not a household name. I’m not in a big superhero movie. But every (actor) has their own desire of the type of material they want to work in. I realize this is a big Paramount (studio) movie starring Matt Damon and has special effects but it still feels like a small movie to me because it’s telling a story and bringing up topics that other big Hollywood studio movies are not. I just want to continue to work on things that I care about. I’m not knocking those big superhero/comic book movies but they don’t really say very much. They’re entertaining, but once you’re done with those two hours of watching those films, you’re done. But Alexander Payne (who directed and co-wrote “Downsizing”) rewards audiences in repeat viewings. With “Downsizing,” you can get something different each time you watch it. Q: What was your experience like coming to Los Angeles? Chau: I wasn’t here long before I got the role on “Treme,” and I had to fly back to New Orleans to shoot that show. My parents laughed and said, “You went so far away from home (to become an actor) just to come right back. It’s funny how roles can pop up that draw on your life in an unexpected way. I never would have thought there would be an HBO series that would have a Vietnamese storyline. They recognized the Vietnamese refugee and immigrant community is a large part of the fabric of New Orleans and incorporated it into the show. When I auditioned for it, I had no idea the character would continue in it. That was my first recurring guest starring role. Before that, I was in one-off episodes of shows. So that was a special job for me in that regard. Q: Do you have aspirations beyond acting? Chau: Yeah, I’d like to write and produce. My initial aspiration was to be a writer. I wanted to go to college and study creative writing. My dad warned me I might be in school for a long time and might not be able to find a job in that field so that’s why I studied film. I thought it would be something I could learn as a trade and could land an actual job after graduating. I was naïve in thinking that. It’s very difficult. That’s the way it is for people in the arts. Q: Do you think with what’s going on in Hollywood with regard to cracking down on sexual harassment and treatment of women, that there might be a shift forthcoming in terms of getting more female voices in filmmaking? Chau: I’m absolutely 100 percent a proponent of there being more diverse perspectives, telling stories, creating the stories. A point I’d like to bring up, though, is while we’re working on trying to push that agenda forward, we have to think we have all these white, male directors who are very talented. They’re not going to all of a sudden stop working and step aside. So, as they continue to work, what is it we would like to see from them? 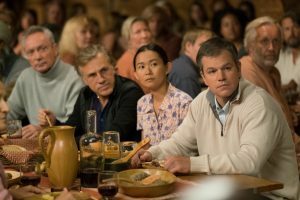 I thought Alexander Payne and (co-writer) Jim Taylor did a wonderful job with “Downsizing,” in terms of incorporating people that don’t look like them. Q: Some critics have blasted your character’s accent as a caricature. How do you respond to that? Chau: The Vietnamese refugee community that I grew up with in New Orleans is certainly an inspiration for my character in “Downsizing,” but, at the end of the day, the character is mine. I feel like people don’t put certain limitations on other actors. When British or Australian actors come to the U.S. and play an American character, we laud them and talk about how great it is that they were able to do this accent that’s not their own. Americans have different relationships with different accents. With the Vietnamese accent, it’s usually because we tend to have service-oriented occupations. That brings up the race and class issue and inequality and discrimination. That’s a lot to unpack so it’s not just about an accent being problematic. My character, and other minority characters in this story, are not there to prop up the white, male character and show him in this great, positive light. If anything, we’re showing that he’s part of the problem because he’s not paying attention. I don’t see anything wrong with that.